The game between Top Four teams took place in Jakarta. Second ranked host Pelita Jaya (7-4) defeated one of their biggest challengers Bima Perkasa (5-6) 73-58. It ended at the same time the two-game winning streak of Bima Perkasa. American guard Carlton Hurst (190-94, college: S.Dakota) scored 17 points and 9 rebounds to lead the charge for the winners and the former international point guard Andakara Dhyaksa (173-92) chipped in 13 points and 7 assists during the contest. American forward David Atkinson (203-91, college: Salem Intern.) responded with 25 points and 6 rebounds. Both coaches used bench players which allowed the starters a little rest for the next games. Pelita Jaya have a solid three-game winning streak. They maintain second position with 7-4 record behind leader Stapac which they share with defeated Bima Perkasa. Bima Perkasa at the other side dropped to the second place with six games lost. They share the position with Hang Tuah and Satria Muda. Pelita Jaya's supporters look forward to an exciting derby game next round, where their team will travel locally in Jakarta to the arena NSH. The game between Top Four teams took place in Surabaya. Fourth ranked host Pacific Caesar (4-6) defeated their close opponent Satria Muda (5-6) 86-80. American forward Qarraan Calhoun (203-86, college: Houston) notched a double-double by scoring 31 points and 12 rebounds to lead the effort and Jjuan Hadnot supported him with 20 points, 6 rebounds and 6 assists. Even a double-double of 35 points (!!!) and 10 rebounds by American forward Dior Lowhorn (201-87, college: USF) did not help to save the game for Satria Muda. Pacific Caesar moved-up to third place. Satria Muda lost fourth consecutive game. Defending champion dropped to the second position with six games lost. They share it with Bima Perkasa and Hang Tuah. Pacific Caesar will have a break next round, and it should allow them to practice more before next game. Satria Muda will play at home against Hang Tuah and it may be a tough game between close rivals. In the last game of round 14 Prawira lost to Satya Wacana on the opponent's court 78-85. The game between Top Four teams took place in Jakarta. Second ranked host Pelita Jaya (7-4) defeated one of their biggest challengers Bima Perkasa (5-6) 73-58. It ended at the same time the two-game winning streak of Bima Perkasa. American guard Carlton Hurst (190-94, college: S.Dakota) scored 17 points and 9 rebounds to lead the charge for the winners and the former international point guard Andakara Dhyaksa (173-92) chipped in 13 points and 7 assists during the contest. Hurst is a former Eurobasket Summer League player, which is considered top international summer league in the market. Four Pelita Jaya players scored in double figures. American forward David Atkinson (203-91, college: Salem Intern.) responded with 25 points and 6 rebounds and his fellow American import guard David Seagers (188-88, college: Dowling) scored 22 points, 8 rebounds and 4 assists. Both coaches used bench players which allowed the starters a little rest for the next games. Pelita Jaya have a solid three-game winning streak. They maintain second position with 7-4 record behind leader Stapac which they share with defeated Bima Perkasa. Bima Perkasa at the other side dropped to the second place with six games lost. They share the position with Hang Tuah and Satria Muda. Pelita Jaya's supporters look forward to an exciting derby game next round, where their team will travel locally in Jakarta to the arena NSH. There was a minor upset in Salatiga where their close opponent Prawira (3-8) was defeated by fifth ranked Satya Wacana (4-8) 85-78. Satya Wacana had a 31-20 advantage in offensive rebounds. Their players were unselfish on offense dishing 23 assists. Americans were the main players on the court. Guard Madarious Gibbs (185-93, college: Texas Southern) notched a double-double by scoring 31 points, 7 rebounds and 15 assists to lead the effort and forward Raymond Miller (204-88, college: CS Fullerton) supported him with 17 points and 14 rebounds. Four Satya Wacana players scored in double figures. Even a double-double of 26 points and 10 rebounds by Dalarian Williams (198, college: Life) did not help to save the game for Prawira. Guard Brachon Griffin (185-92, college: Elizabeth City, agency: SDJ Sports) added 24 points, 6 rebounds and 4 assists for the guests. Prawira's coach Andre Yuwadi rotated ten players in this game, but that didn't help. Satya Wacana maintains fifth position with 4-8 record which they share with defeated Prawira. Prawira lost third consecutive game. They keep the fifth place with eight games lost. Satya Wacana will play against higher ranked Siliwangi (#4) in Bandung in the next round and it may be quite challenging game. Prawira will play at home against the league's leader Stapac and hopes to get back on the winning track. The game between Top Four teams took place in Surabaya. Fourth ranked host Pacific Caesar (4-6) defeated their close opponent Satria Muda (5-6) 86-80. Pacific Caesar forced 20 Satria Muda turnovers. Strangely Satria Muda outrebounded Pacific Caesar 43-31 including 30 on the defensive glass. American forward Qarraan Calhoun (203-86, college: Houston) notched a double-double by scoring 31 points and 12 rebounds to lead the effort and the other American import forward Jjuan Hadnot (190, college: Grand View) supported him with 20 points, 6 rebounds and 6 assists. Five Pacific Caesar players scored in double figures. Even a double-double of 35 points (!!!) 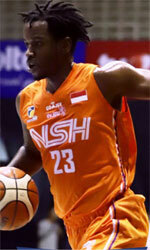 and 10 rebounds by American forward Dior Lowhorn (201-87, college: USF) did not help to save the game for Satria Muda. International forward Jamarr Johnson (193-88, college: Widener) added 19 points, 15 rebounds and 5 assists for the guests. Pacific Caesar moved-up to third place. Satria Muda lost fourth consecutive game. Defending champion dropped to the second position with six games lost. They share it with Bima Perkasa and Hang Tuah. Pacific Caesar will have a break next round, and it should allow them to practice more before next game. Satria Muda will play at home against Hang Tuah and it may be a tough game between close rivals.